The Shabby Stamper: PCS Treat Box! 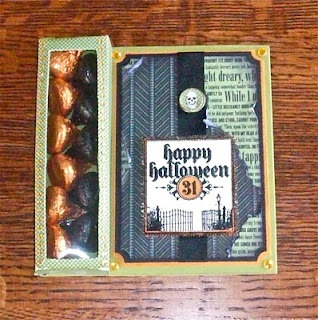 I made this Treat Box from the FREE template available from the Paper Crafters Sampler. It's totally darling and so easy to make! I layered Old Olive, Pumpkin Pie, Basic Black and various patterns from the Nite Owl ds. The sentiment is heat embossed with Detail Black ep, then cut out so that all the 'jags' show. I colored the exposed white around the frame with my Pumpkin Pie marker. I also embossed the '31' on Pumpkin Pie ds, punched it out and covered with with a clear token from the Build-a-Brad kit. I also used the Build-a-Brad kit to make the upper brad. I cut out the tiny skull, then glued it to a piece from the Nite Owl ds and covered it with a token. What a fun and creative idea! I love the way you used the Dark & Dreary set. Mine should be coming this week and I can't wait.